Ok, time to go look in your pantry. I know you have food in your pantry, cereals, pastas, breads, snacks. Do you know what is in them? Do you check the labels before loading them into your cart at the supermarket? Are all the ingredients pronounceable? If you don’t know it is time to go and check it out and pitch the bad stuff or at least decide that is the last time you will buy it. 1. High Fructose Corn Syrup – Highly processed and shown to cause the liver to release more fat into the bloodstream – so will make you FAT instead of giving you energy like sugar. 2. Artificial Sweeteners like Aspartame, Saccharin (Equal, Sweet ’N Low) – Increase your risks for cancer, especially in young children. 3. Trans Fat usually says Partially Hydrogenated Oils – Raises levels of bad cholesterol, increasing the risk of heart disease. 4. Monosodium Glutamate (MSG) – Unfortunately this is a tough one to pinpoint since there are 40 names on the list that might be MSG. The only way to know you don’t have MSG in a product is to buy organic. MSG is known to interfere with brain chemistry and have been implicated in many neurological diseases, such as brain cancers, MS, fibromyalgia, depression and hyperactivity (ADHD) as well as being linked to obesity. 5. Nitrates (Sodium Nitrates) – Commonly found in lunch meats, hotdogs or any prepared meats. Nitrate is harmless, but it can convert to nitrite, which can form nitrosamines, a powerful cancer-causing chemical, in your body. 6. Potassium Bromate – Chemical used in commercial bread causes cancer in animals and has been banned every other country around the globe except US and Japan. FDA has yet to do anything about it. 7. Artificial Coloring – Blue No 1, Blue No 2, Green No 3, Red No 3, Yellow No 6 – All of these have shown tumor or cancer risks. Since it is hard to remember those I try to avoid all artificial coloring. 8. Added Sugars – Sugar, Sucrose, Dextrose, Honey, Fruit concentrate, Fructose, Corn syrup, High fructose corn syrup. I use organic agave nectar, or organic maple syrup, or local honey. 9. Enriched flours/pastas – Enriched means the bran and the germ that contains all the vitamins and minerals in wheat have been removed. Why is this bad? Because the body absorbs enriched flours quickly flooding the blood stream with sugar and then turns it into fat. 10. Genetically Modified Organisms (GMO) – Seeds containing GMOs have been engineered to withstand pests and harsh growing conditions and produce vegetables/fruits that are identical in size, shape and taste. Look for “No GMO” or “GMO Free” produce stickers or buy organic. Check out this label, what is wrong with it? 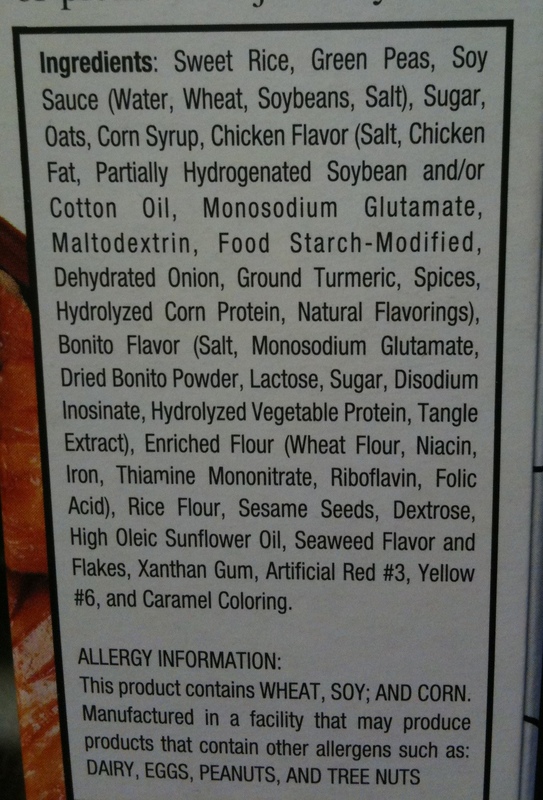 First, more than 5 ingredients, ingredients include partially hydrogenated oils and MSG. Ick – put this one back on the shelf! Now, check your pantry. Next time you go to the supermarket check those labels! Or better yet keep to the outskirts of the supermarket aisles where the fresh foods are and away from the middle where the processed food like items are. Stayed tuned for my next post of what I do have in my kitchen….